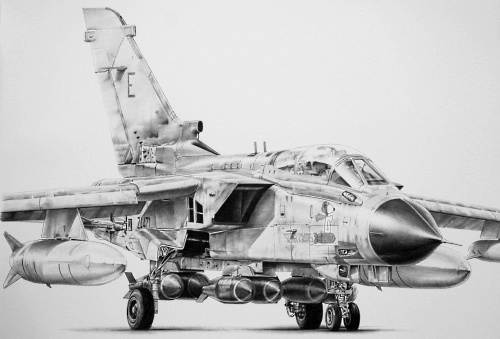 This original aviation art pencil drawing by James Baldwin is of a Tornado GR1 based at Muharraq, Bahrain during the Gulf War. The aircraft sported 'nose art' and ZA471 was known as 'Emma'. She has the weapon load of her first war sortie. Just before dawn on the 17th January 1991 the bombs were to rain across the Hardened Aircraft Shelter sites at both ends of the Iraqi airfield. Precision Bombing was not an option. Instead the four Tornado bombers were to attack the airfield at low level and when close enough, each aircraft would climb steeply to each throw eight 1,000 lb bombs at the target. After bomb release a 135-degree wingover would allow the aircrew to egress from the target toward friendly territory. Under the cover of darkness the risk to the aircrew would be minimised. That was the plan. ... read more.